This is a scalable context timeline. It contains events related to the event (9:16 a.m.-9:29 a.m.) September 11, 2001: Secret Service Does Not Evacuate President Bush from the School, despite Its Safety Concerns. You can narrow or broaden the context of this timeline by adjusting the zoom level. The lower the scale, the more relevant the items on average will be, while the higher the scale, the less relevant the items, on average, will be. Edward Marinzel. [Source: Command Group]Secret Service agents and other staffers with President Bush in Florida are worried about Bush’s safety while he is at the Emma E. Booker Elementary School in Sarasota, and some of them are concerned that terrorists might try to attack the school. [Studies in Intelligence, 9/2006 ; Politico Magazine, 9/9/2016] Bush and his entourage arrived at the school, where the president is now attending a reading demonstration, shortly before 9:00 a.m. (see (8:55 a.m.) September 11, 2001). [Sammon, 2002, pp. 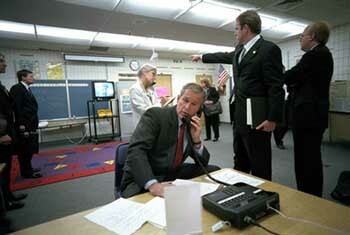 41; Washington Times, 10/7/2002] Members of the president’s staff who are in a holding room at the school while Bush listens to the reading demonstration are promptly informed about the second hijacked plane crashing into the World Trade Center after the attack occurs (see Shortly After 9:03 a.m. September 11, 2001). [White House, 8/12/2002; White House, 8/12/2002] Karl Rove, Bush’s senior adviser, who is at the school, will later comment that while details of the terrorist attacks in New York are “hazy,” it is clear that “unknown assailants [are] executing a well-planned attack, of unknown dimensions, against America.” [Rove, 2010, pp. 251] Secret Service agents responsible for protecting the president therefore have serious concerns that Bush could be in danger at the school. Lead Agent Wants to Leave the School 'as Fast as Possible' - Edward Marinzel, the head of Bush’s Secret Service detail, has “quite a worried look on his face,” Mike Morell, Bush’s CIA briefer, will recall. [Studies in Intelligence, 9/2006 ] Marinzel “wanted to get the hell out of [the school] as fast as possible,” Morell will say. Representative Adam Putnam (R-FL), who is at the school, overhears Secret Service agents telling members of Bush’s staff, “We need to get [Bush] secure.” But before the president and his entourage leave the school, there is “angst from the Secret Service that we don’t know what’s out there,” according to Andrew Card, Bush’s chief of staff.